This film is the perfect vehicle for the extremely accomplished Saoirse Ronan to deliver an understated yet forceful performance as Irish immigrant Eilis Lacey exchanging a small town in County Wexford for life in the big city. Set in the early 1950s with a Nick Hornby adaptation of a Colm Tóibín novel this film is classy, visually stunning and filled with characters that are more than three-dimensional. It is wonderful! The story is important so I won't give anything away. The narrative centres on the development of the main character Eilis, who is in every scene. From mousey country girl to confident city dweller the transformation is both remarkable and believable. In making such a move there is always a cost and the question becomes is Eilis willing to pay up. She leaves her home town because it is small and filled with small-town characters. She wants more. 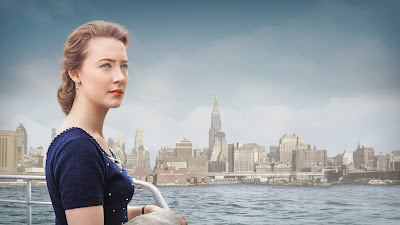 However, when Eilis uses the things she has learned in Brooklyn to help her take another look at her home town on a return visit, she begins to see the possibilities for a different, possibly brighter future for herself back in Ireland. Will she stay or will she go? There are of course complicating familial factors and love interests that entangle her heart strings. It is how she untangles these and comes to understand their importance within her relationships that gives the film its central thrust and helps Eilis to make meaning that enables her to set a course to follow. This process is undertaken with lots of hand-held screen-filling close ups of Ronan's face as she emotes her way through this painful process. The soundtrack of this film is wonderful and adds weight to the poignancy of each scene. Julie Waters is wonderfully cast as Mrs Kehoe running her boarding house for young ladies. The colours reinforce the contrast of the mood of the two contexts - muted and misty brown/greens for Ireland and bright eye-popping pastels for Brooklyn and Coney Island. Both Jim Broadbent and Domhnall Gleeson contribute strong supporting performance - but the centre stage belongs to Ronan. This is a lovely and gentle love story about hope, courage, honour, potential and dreaming of a new life. It is brilliantly acted and wonderfully shot. It is a film that you should see if you've not already done so. There is much to reflect on here about relationships, love, family and the power of 'home'. I'll give it 8/10. Search This Blog - more than 400 reflections!